Minuteman Road Club » Blog Archive » COLEMAN OPENS MRC 2018 SEASON WITH A BANG! 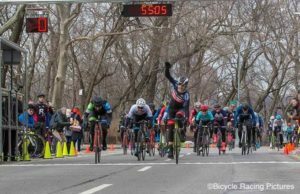 While a number of the MRC race team members were off in California at the spring training camp our own Directeur Sportif, Tom Coleman, made the short trip down to NYC for the CRCA Grant’s Tomb Criterium. MRC: Hi Tom, congrats on the win a few weeks back! MRC: OK… So… How was the race? You made the solo trek down to NYC and it seems like it paid off. You opened the young season with a win in the Men’s 2-3 race and then jumped into the P/1/2/3 race. Tell me about that. TC: Grant’s Tomb, for anyone that’s done it before, is a different type of race. It’s really out side of the reaches of the “normal” New England racing scene but just close enough to make it work. It’s also unlike any race I’ve done before cause it’s in Manhattan. It was a long drive 7-8hrs both ways and I was not looking forward to turning and burning for two crits. And I was flying solo as compared to the last year where a large group of us made the trip with a 2am McDonalds stop. But my wife encouraged me to do it anyway. It was “warmer “ than the previous year, 35° compared to 20° with a 15mph wind. The race was a race and I was pumped to Win the 2/3 and get my first win as a Cat 2, then going on to the p123 race and finishing despite freezing was another win. Oh, I avoided McDonalds this year so that’s a win, win, win!! MRC: Wow, that’s quite the accomplishment. You did it solo too. Why didn’t you have any of the usual Cat 2’s or 3’s with you in the race? TC: Well, I went solo because everyone else was else was busy getting sick in California from the now infamous Cratt-flu at the Reverse Training Camp. MRC: I guess you can totally consider that a win, win, win, win situation! OK, I know you like to keep it short so we’ll cut this portion off here. Thanks Tom! This entry was posted on Tuesday, April 3rd, 2018 at 9:23 pm	and is filed under Road Racing. You can follow any responses to this entry through the RSS 2.0 feed. Both comments and pings are currently closed.